I came across this very healthy and fresh looking Raw banana’s in the vegetable store. Must admit the poor thing has not been one of my house favorites. However, I wanted to try out some innovative way to get them on kids list. I am fundamentally not a believer of long hours or strenuous cooking as I run short of time with my office schedule keeping me on my toes. Nevertheless, I wanted to make something interesting out of it that didn’t take much time considering that mornings are pretty challenging. So, like I do for most of my cooking I did some preparations at night . 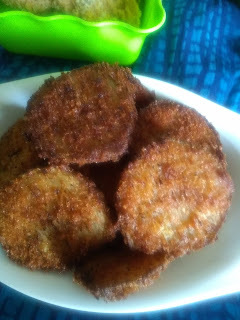 I sliced them and wrapped them in cornflour followed by coating with bread crumbs and kept them nicely stacked in a box into the fridge. 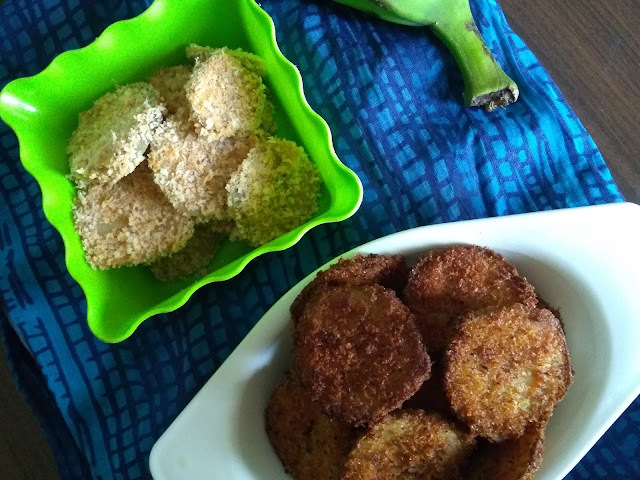 Since I worked on my Sambhar beforehand preparation in similar way, I just had to deep fry the banana slices in oil while the rice was steaming. It took probably less than 30 minutes for the entire meal to get into the lunch box. How I make Sambhar a easy task in the morning and I will be happy to be sharing the same in another post. The crispies turned out to be really good. Just to add, it has become a favorite with the kids now ! Heat a wide pan of water just enough to dip the banana slices. 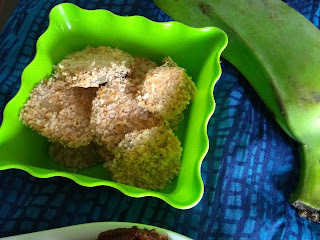 When the water starts boiling, add the Sambhar masala , salt to taste ( 1 used 3/4 tsp) and place the banana slices to this. Now add the red chilli powder to the bread crumbs and keep aside in a plate and in another bowl mix cornflour with water . Take one slice of raw banana and dip it in cornflour mix and then into bread crumbs till it coats well. Deep fry 3-4 slices and place then in paper towel to drain the excess oil.